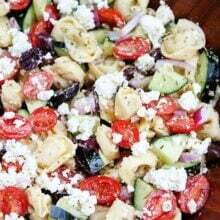 Summer Tortellini Salad-this easy tortellini pasta salad has all of your favorite summer ingredients: tomatoes, Red Pepper, corn, cucumbers, and the BEST basil vinaigrette. 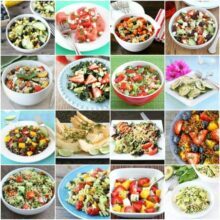 It is the perfect salad for summer potlucks. Our garden is out of control and I am pleasantly surprised. I have never really had a green thumb, but this year I feel like all of my fingers are green. Our garden is thriving, especially our basil. I can’t keep up! I have been making pesto and basil vinaigrette nonstop and I still don’t make a dent in our basil. I decided to put all of our garden goodies to use and make a Summer Tortellini Salad. Best decision ever because it was easy to make and the entire family loved it, including the kids. 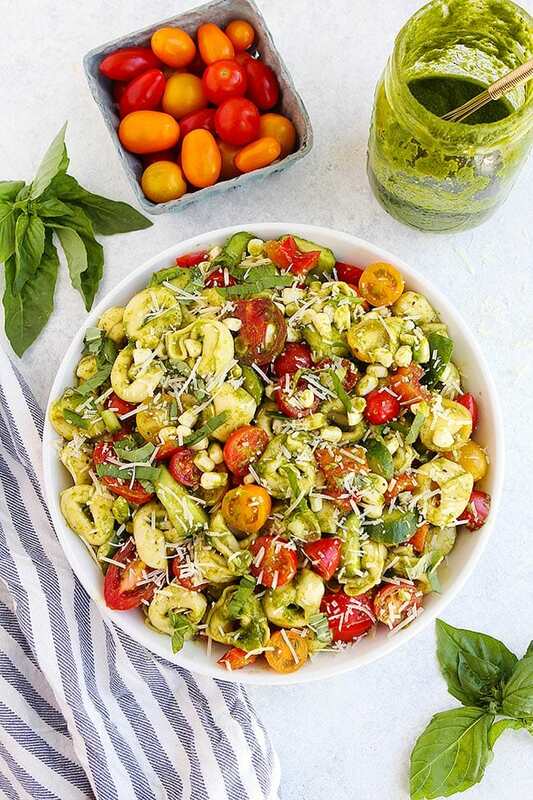 You need to put this tortellini salad recipe on your summer to do list because it is guaranteed to be a favorite! If you have a garden, chances are you have all of these ingredients right outside in your yard, if not, go ask your neighbor or hit up the farmers market. Make the most of summer’s produce, it is all so good! And I have to say that the basil vinaigrette MAKES this salad. If you’ve had my basil vinaigrette, you know what I am talking, if you haven’t, you are in for a real treat. It is the BEST! You can use fresh or frozen cheese tortellini for this salad and you should be able to find it at any grocery store. If you can’t find tortellini, you can use your favorite pasta salad, but the cheese tortellini makes the pasta salad extra tasty. I love using grape or cherry tomatoes in this salad because they are so sweet and colorful. If you have larger garden tomatoes to use up, you can chop the tomatoes and add them to the salad. Cook the tortellini according to the package instructions, it will only take a few minutes. Once it floats to the top it is done, you don’t want to over cook it. Rinse the tortellini with cold water and drain well. You don’t have to cook the corn before adding it to the salad. Use a sharp knife to remove the corn kernels from the cob. If you can’t find good, fresh sweet corn, you can use frozen corn. You can make the basil vinaigrette in advance, it will keep in the refrigerator for up to 4 days. Just whisk it before adding it to the salad. Pesto would also work well in this salad. I like to finish the salad with Parmesan cheese and a little extra basil. Serve this tortellini pasta salad cold or at room temperature. It will keep in the refrigerator for up to 3 days. 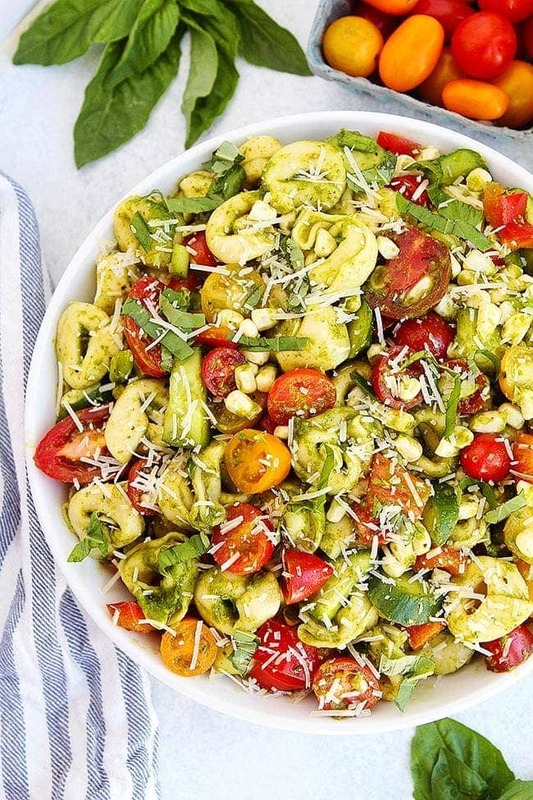 Enjoy this easy tortellini salad all summer long! It is a family favorite! 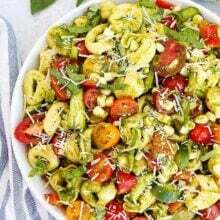 Summer Tortellini Salad with tomatoes, red bell pepper, corn, cucumbers, and basil vinaigrette! 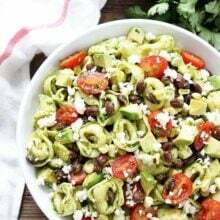 This cold pasta salad is a summer favorite! Cook the tortellini according to package instructions. Rinse with cold water and drain well. Place the cooked tortellini in a big bowl. Add the tomatoes, bell pepper, corn, cucumber, and green onions. Drizzle with basil vinaigrette and stir until the ingredients are well coated. Season with salt and pepper, to taste. Finish the salad with Parmesan cheese and fresh basil. Serve cold or at room temperature. Note-the salad will keep in the refrigerator for up to 3 days. YUM! This literally has *all* of my summertime faves! 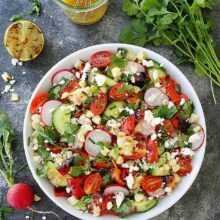 Yum, this salad looks incredible and I love all the ingredients, plus it’s so simple to make! AMAZING! The basil vinegarette is EVERYTHING coupled with the dynamics of the pasta and a little crunch from the sweet corn. I will definitely make this again! Thank you for sharing!